Welcome to the wonderful world of decentralized cryptocurrency, aka the "wild, wild west" aka "anything goes". Well, not anything, especially if you catch it before it catches you. I've been in the crypto space for many, many moons and have seen what I think is just about "everything" that a rapidly rising industry could go through: excitement, terror, growth, fallback, innovation, setbacks, massive profits, and massive scams. Trust me, it's not all bad. In fact it's very good, when you can learn how to avoid and stop the scams, FUD and negative vibes that uneducated or greedy people bring about. 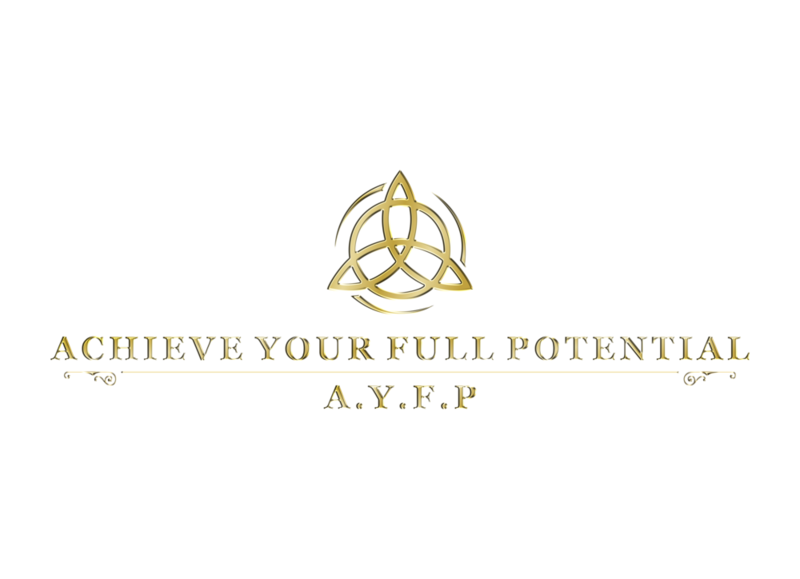 It actually brings together unity of like minds and happiness for those that are gaining the true benefit of what it is; a way to get ahead in life, communicate better, speed up the process and make some money in the meantime. I'm an advocate for innovation, unity, and positive vibes. NOT corruption, theft, and misinformation... Which is why I'm posting this blog on my super busy schedule to ensure you don't get caught up in a scam like this. Please see below. A scam where a user has tried to re-sell me information they've taken from paid groups first without doing due diligence of what the information source is, without asking permission and knowingly immoral. Here's how to spot this specific scam and put a stop to it immediately. 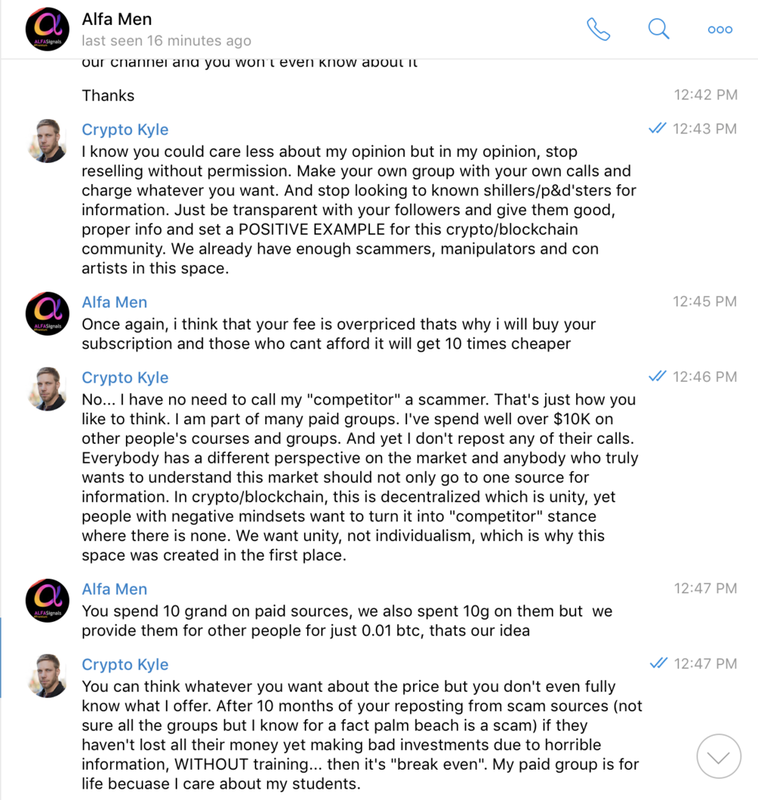 I'm posting our exact conversation below and then I'm going to contact all the groups this member has stolen from to let them know they are being taken advantage of (except for the known pump & dump groups, which should not be promoted at all). 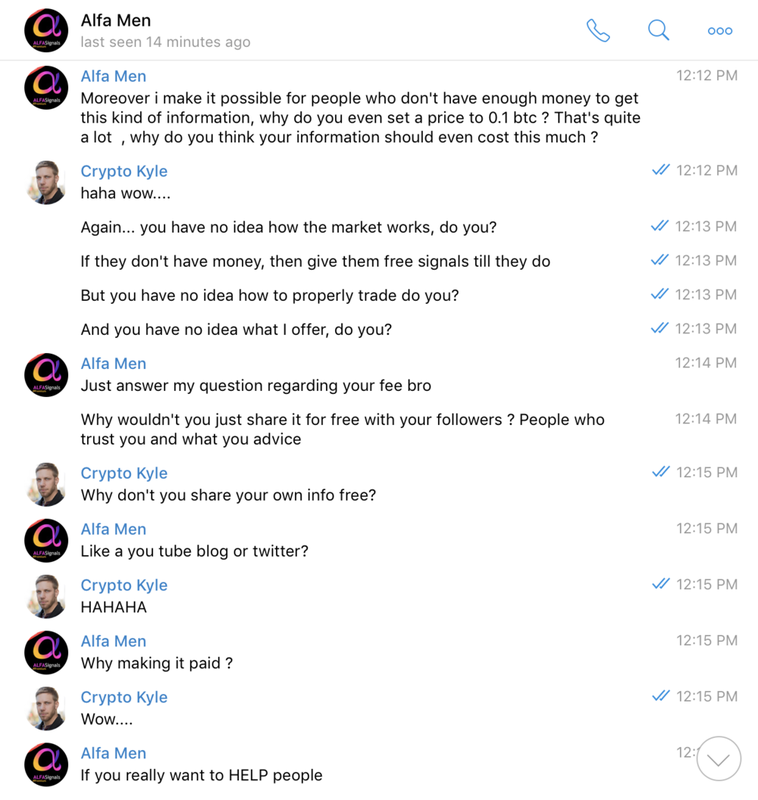 FIRST OFF, BLOCK @Crypto_Alfa on Telegram to avoid being brought into this scam. If you are a part of it then you could be implemented if criminal charges happen. Pump & Dump groups (I'll make a separate blog on this) are deadly for anybody that are not on level 1 or 2 in this pyramid. The pump & dump group starts at the top and buys into heavy positions then shills these coins to their following and quickly sells once many buyers come in at massive profits usually from 2x - 10x and anybody buying in above the 1x mark usually gets caught and loses their money to.... the level 1 & 2 people that started the pump. Sure they benefit but it hurts the entire market as a whole because 90% of the people come out on the losing end and that kills motivation to stay in the market and many of these people have families and hard pressed lives they are trying to support. So as you can see they are a scam. There is much more info on them online, just search it up. 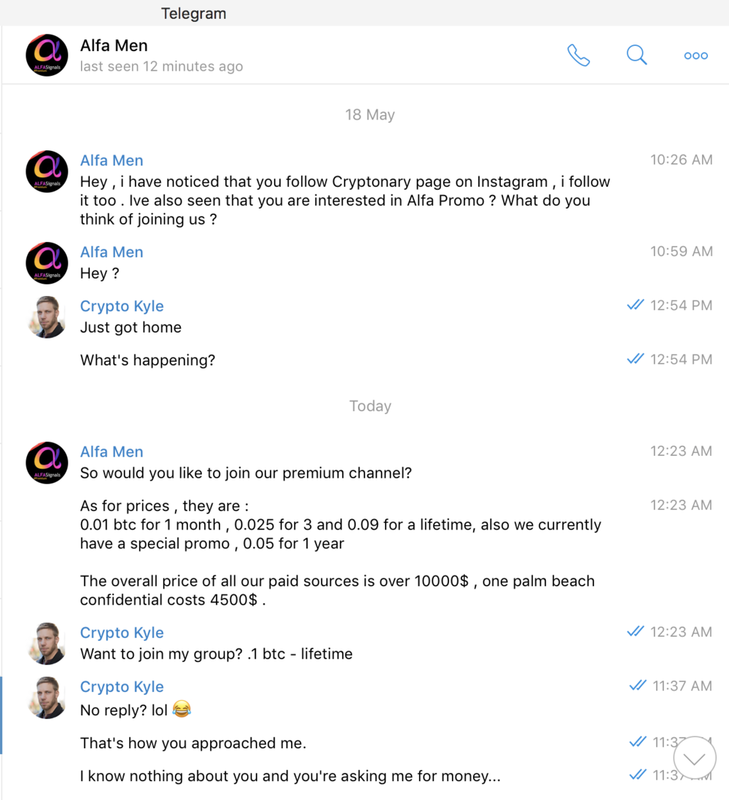 And as you can see in these interactions with Alfa Men, I have stated several times that they are a scam and he didn't even blink an eye. He is openly promoting a scam to earn money from their "information" for his own benefit. But this hurts the market as a whole when people promote information that ripple effects the industry to scare them out of the market. So something "this little" actually has a heavy impact on the market. Regardless of the time, they were MY calls based off MY education in the crypto space. And since then we've still seen weekly gains even in a down market and have avoided CATASTROPHIC losses by using some strategies in my course. I'll be providing a proof of results sheet in the coming days. It's not that easy to make a crypto call and it be profitable. Everybody seems to think you'll make thousands of dollars overnight (which can happen, but you have to control your assets, not let them control you). And it's even harder to do so in a down market. But ANYBODY can forward information from someone else and call it "legit" without doing their homework, which is the case with ALFA MEN. I will NOT accept anybody's payment into my group/course if you are a scammer, I don't care how much money. So I'm not rational? What is this world coming to? 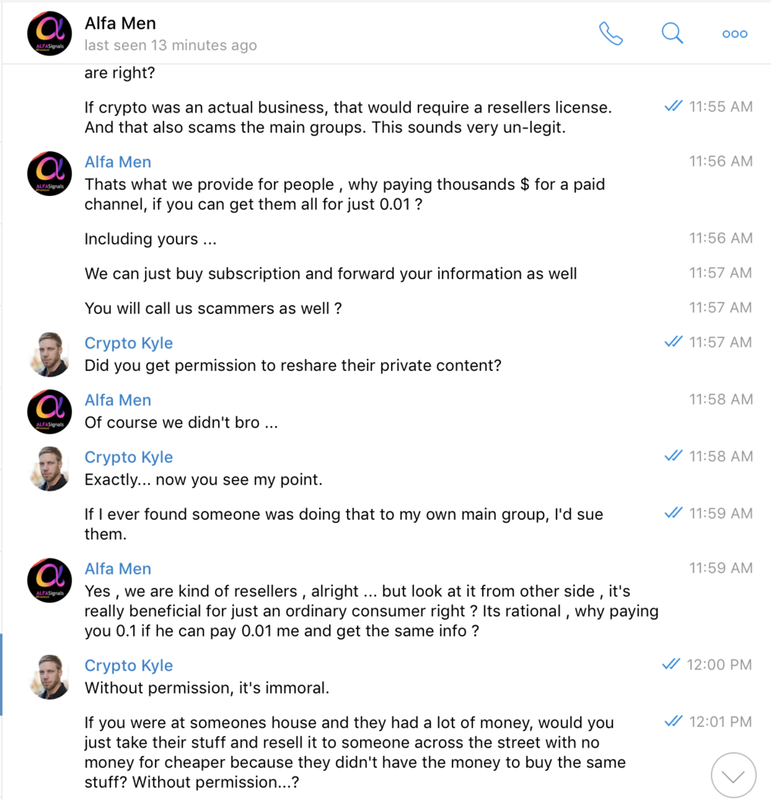 As you can see, Alfa Man will change their name and run the same scam over and over again if they must, so it's good to be educated on how this scam works and let others know about them so you can make friends with them and avoid the scammers. 2.) Some of the info sources he provides are from known scammers, so that alone could scam you out of your entire investment if you were to take it to heart. 3.) 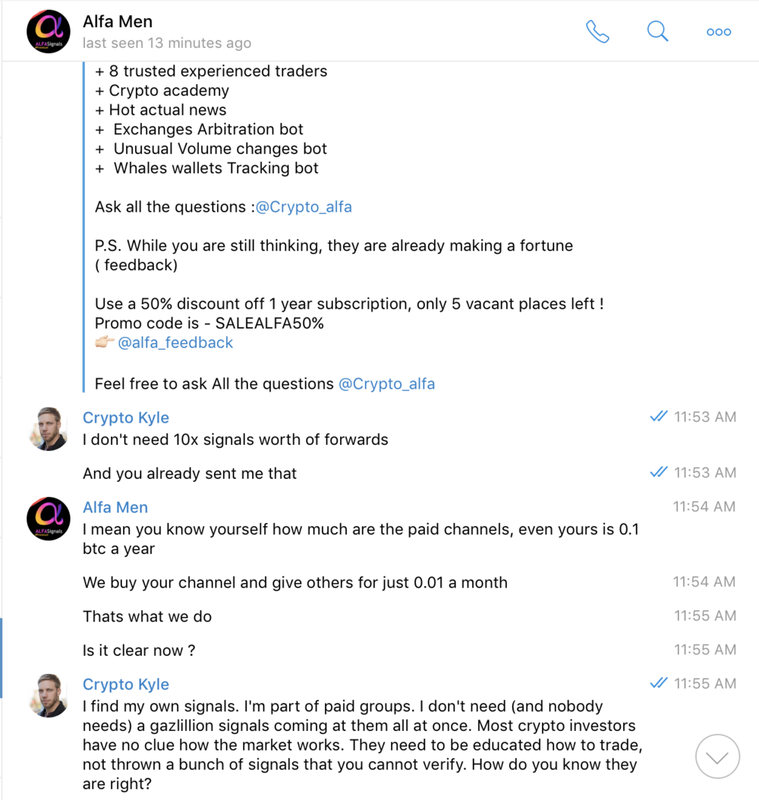 For someone supposedly in the crypto space longer than I, how do they not know they are selling information from scammers? 4.) They had a website but there were not websites in their "sell" description. Meaning they are not transparent. 5.) Who the hell is this person anyways? Nobody is getting a penny from me without me doing my homework first. Same with a crypto investment. Too many people trust what someone else says in a chat, youtube, twitter, etc... without understanding the market and doing their own homework = bye bye investment. Anyhow, just wanted to make you more aware and help you avoid risk investments. Hope this blog added value to you. Feel free to join me in our crypto telegram groups, youtube and join my newsletter for more up-to-date FACTUAL information in the crypto space that will help you maximize on your investments. PS, I'm not a financial advisor or accountant. Always do your own due diligence when investing. **If you have any other scams you'd like to make aware, post them below or contact me and I'll do a review on them or go undercover and expose them! Let's work together to clean up this crypo space and make it the worthy investment we all need and want! Get up-to-date crypto news & information.